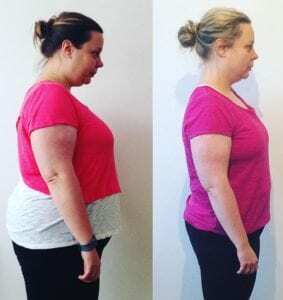 There’s absolutely no doubt about it…the keto diet will help you lose some serious weight and over a very short period of time – you can lose anything from 4-10kg of weight in less than one month! I was absolutely amazed at the results! Don’t get me wrong it was very challenging but 100% worth it and the best my body has ever looked! I’ve since used the 28 Day Keto Challenge with hundreds of my 1-1 personal training clients who train with me at LEP Fitness. I’ve also sold thousands of the Keto Challenge e-book online through my health and fitness blog. The aim of this article is to make it the most comprehensive keto blog on the web! I’m literally going to share everything that you need to know to get amazing weight loss results, improve your body shape, and just generally lead a healthier, happier and better quality of life. After reading this post you’ll never need to read another Keto Blog again, in fact you’ll be a keto expert! lol! The keto diet is a form of low carb dieting. In a nutshell…it’s where the majority of your diet is made up of foods high in fat and protein, with very minimal carbohydrates (typically less than 30g per day). 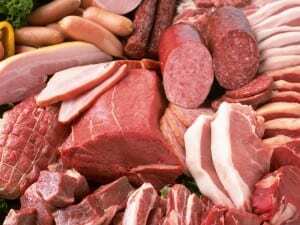 This type of low carb diet has been used for centuries, commonly used to treat and control diabetes and offered as an effective treatment for children with epilepsy when medication fails to work. There are also lots of health benefits to the keto diet which we will look at throughout this post. The keto diet is extremely popular because it forces the body to use fat as it’s main fuel (instead of carbs). The diet also removes the food group ‘carbohydrates’ which means that you are likely to eat less overall calories – which is why you lose weight. Carbohydrate foods are also very easy to over consume, think of carb rich foods such as pasta, pizza, chocolate, bread, and sweets – and you realise how easy it is to consume too much! Too many calories leads to weight gain, whereas if you cut out these highly palatable foods and lead a keto lifestyle you are very likely to lose weight (and lots of it!). Like all diets there’s nothing magical about the keto diet that makes you lose weight! You only lose weight if you create a calorie deficit. Lots of people still believe that it’s the specific diet that they’re on that’s making them lose weight, when in fact it’s simply because they’ve ‘created a calorie deficit’ – the calorie deficit is what’s doing the job, not that the diet! If you only ate one Chocolate Bar per day (and that’s all you ate every 24hrs) you would lose some serious weight! You’d lose more weight only eating one chocolate bar a day (approx 300 cals), than you would eating 1,000 calories of healthy foods (meat, fish, veg, fruit) – because with the chocolate bar you’re only consuming 300 cals vs the healthy food of 1,000 calories! When it comes to weight loss the more you create a calorie deficit the more you lose weight. That said… the more you create a calorie deficit the worse you feel, and you also lose muscle mass (which you want to avoid). Also, you still need to give your body key nutrients: protein, fibre, vitamins and minerals – to help keep you healthy, and give you energy so that you can workout, perform at work, etc. 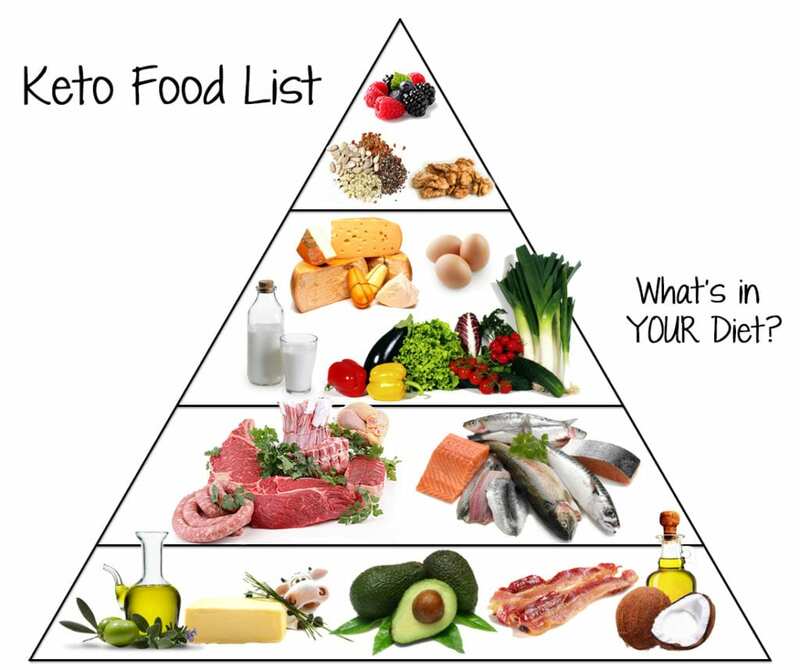 By following a system such as the keto diet it does help give you a framework to follow and one which cuts out lots of processed carb foods – which can lead to weight gain, diabetes, and inflammatory diseases. Therefore in my opinion the keto diet is one of the best diets for weight loss, because it’s very simple and straight forward to follow and is rich in nutritious foods. 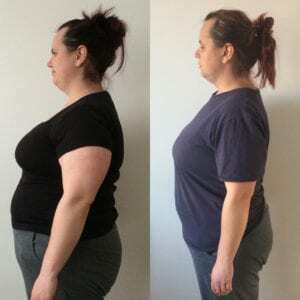 The keto diet has gained a vast amount of traction over the last 8 years, becoming very popular in Hollywood amongst celebrities and other influential figures from around the globe. Celebrities such as LeBron James, Kim Kardashian, Megan Fox and Gwyneth Paltrow are all fans of the Keto Diet. 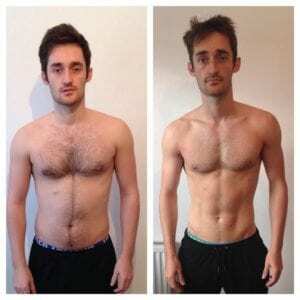 Due to the keto diets success rate amongst Hollywood stars, it’s now followed by thousands of members of the general public, especially the younger generation who are focused on improving their image, so that they too can look like their Hollywood idols! Weight Loss – we’ve already talked about how the keto diet works for weight loss (so I wont repeat) – but losing weight will help improve your health, reduce the chance of type 2 diabetes and give you added psychological confidence (which is extremely important!). Lowers Inflammation – carbohydrates cause inflammation in the body, for example too much sugar can cause headaches, aches, pains, brain fog, gut issues, weight gain, etc. Whereas when you remove inflammatory foods from your diet… health improves. When you go Keto you can expect to see improvements to not only your body shape, but also healthier skin, and improved cognitive functioning. 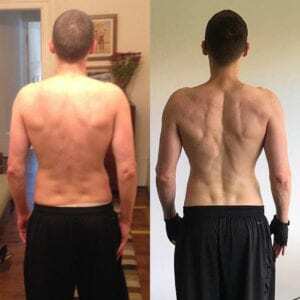 Improved muscle definition – There’s a good amount of protein in a Keto Diet. Protein is imperative to a healthy lifestyle. If you want to have a lean and athletic looking shape, or just generally want to be firmer then you need plenty of protein each day. 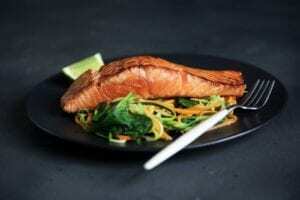 Protein helps build and support muscle mass. As well as helping you look better, protein is also important for healthy nails and skin, to name but a few benefits (read more about the benefits of protein here). Keeps you fuller for longer – Foods which are high in protein and fat help keep you satisfied for longer. If you think how full you feel after eating a steak, compared to when you eat a couple of slices of pizza – you’ll understand what I mean. The steak will make you full and be approx 400 calories, whereas for two slices of pizza it could be around 500 cals and you are likely to want to eat more! Protein and fats keep you fuller for longer compared to carbs… where you are more likely to eat more, and be less satisfied (meaning you’ll eat more carbs shortly after!) not good for the waistline! One of the benefits of following a keto diet is that there’s a bunch of healthy, and nutritious foods to choose from…and which also taste delicious! These types of foods are very filling, keeping you fuller for longer and reducing the likelihood of snacking throughout the day (which can lead to weight gain if too many calories are consumed). Meat and Poultry foods are also rich in amino acids which are the building blocks for healthy muscles. 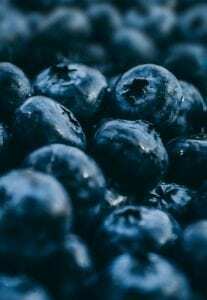 These foods also contain lots of Vitamin B12 (for healthy blood and nerves), and are high in Iron – which helps to support the immune system and prevent fatigue. Similarly to the meat and poultry example above, Fish are high in amino acid proteins which are not only important for muscle, but also for healthy nails, hair and skin. 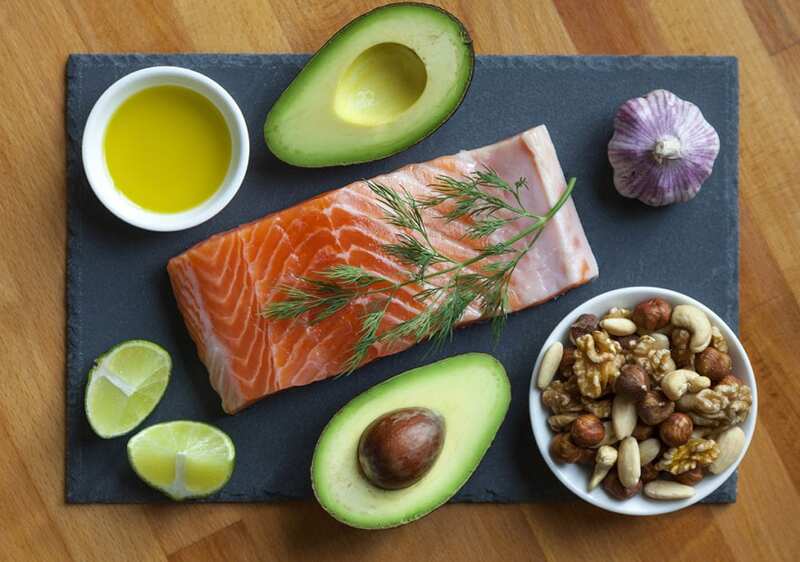 Fish has also been labelled as a ‘brain enhancer food’ which means that it helps to improve cognitive function, for example things such as improving mental clarity, and improving memory. Vegetables are ‘super foods’ which give the body energy, and help to flush out toxins as they are high in fibre. They also contain valuable micronutrients to support the body. 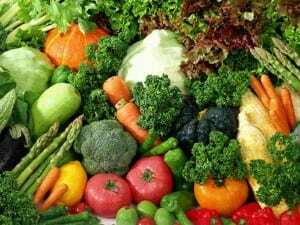 Micronutrients are things such as Vitamins: A,B1,B2,B3,B5,B6,B8,B9,B12,C,D,E,K and Major Minerals such as: calcium, magnesium, and potassium. These vitamins and minerals help the body in lots of ways e.g boosting your immune system, supporting metabolism, repairing damaged muscles and skin cells – to name but a few amazing benefits of vegetables. They also keep you full and satisfied, especially when combined with a meat/fish dish. Similarly to the vegetable benefits mentioned above… fruit also contains lots of micronutrients, and fibre. Fruit is also high in antioxidants which help protect our body from illness, disease and infection. Although fruit is high in sugar, most fruits in 80g portions contain less than 20g of sugar, meaning you can have 1 portion of fruit per day whilst on a keto diet and still stay in ketosis. 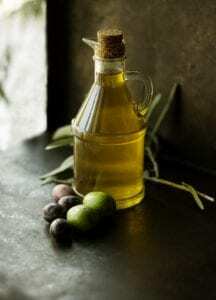 A great way to cook your keto foods is to use oils and spreads, they also enhance the flavour of your keto dishes. These oils especially are high in saturated fats which can boost fat burning and give your brain and body a quick supply of energy. They are also linked to reducing heart disease. When following a keto diet I’d recommend eating 4-5x per day, 3 main meals: breakfast, lunch and dinner, and then 1-2 snacks. The snacks mentioned above can be really tasty, for example you could make a chocolate protein shake, with almond milk, or you could snack on 20g of dark chocolate in the afternoon when your energy levels start to dip at work. There are literally thousands of keto recipes which you can find online. For me personally I like to keep thing very simple, typically having either grilled or fried meat/fish with some vegetables. I like the simplicity, ok it’s not a fancy but you can still make simple dishes taste delicious by adding spices. There are two ways to follow a keto meal plan, one is to keep things basic like I’ve just mentioned above. The advantage of this is ‘simplicity’ – if you don’t really enjoy cooking and see it as a waste of time (like me! lol! )… then you can cook in bulk and eat the same foods most days. For example you could cook up 1kilo of chicken to last you 2-3 days. Ok it’s a little bland at times but at least it’s simple! If you are the type of person who enjoys cooking, or who gets bored easily on a diet and likes plenty of variety, then choose this option. Otherwise you will get bored, lose interest and fall off plan! You’d be best experimenting with different recipes each week, and mixing things up to keep you satisfied. Like I said… this works really well after your Keto Diet ends! It’s more sustainable in the long run – remember you don’t have to restrict carbs for ever! 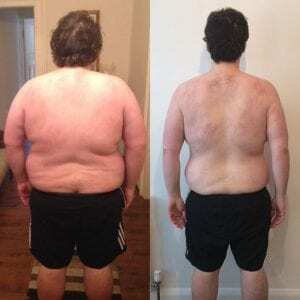 just 4 weeks on a Keto Diet will get you amazing results! Then you can slowly reintroduce carbs and follow a calorie controlled diet. If you do this correctly you will still maintain your results! win win! Bread, pasta, chocolate, sweets, pizza – I know they all taste good but they contain a whopping number of carbs and you should try and stay clear of these foods until your keto plan comes to an end. Then if you re-introduce these foods make-sure to do so slowly, otherwise you run the risk of binging and losing all of your results. IMPORTANT: Although the keto diet is a low carb diet I do still recommend having some carbohydrates, most of your carbs should come from your vegetables and 1 portion of fruit. But I do also recommend having 1-2 carb meals per week, not big one’s – for example maybe just 40g of rice or 100g of potatoes. This will give you a well needed boost of energy but wont knock you out of ketosis. Most days you will only be eating around 30g of carbs per day – 20g from fruit and 10g from veg) so a couple of days per week, to have an extra 20-30g of carbs via rice or potatoes wont do you any harm. For me this is the most pleasurable part of the keto diet, don’t get me wrong I like the main meals (breakfast, lunch and dinner) but living off meat and fish can sometimes be a bit boring! 20g dark chocolate – amazing in the afternoon when energy levels drop, or good to have before working out to give your body an energy boost. 20-30g of nuts – grab a handful of nuts to keep you full and boost energy. 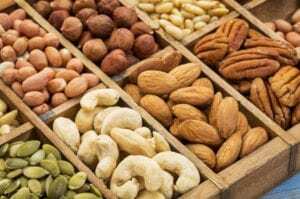 You could weigh them out and take them to work with you, or you could buy the snack packs from a service station or supermarket on your lunch break – I’m a big fan of Graze nuts. 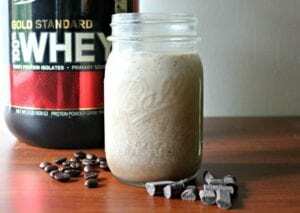 Grenade Carb Killa – want the taste of a chocolate bar but without all of the sugar? Then I’d recommend having a Grenade bar as a treat once or twice per week. They are delicious and contain only 1-2g of sugar (depending on the flavour you choose). Realistically, most of you reading this will still want to eat out with your friends and family. Maybe your work permits you to taking out clients for lunch and dinner? It’s something which is inevitable for most, so it’s good to have a plan of action. This may be pointing out the obvious, but hopefully now you know a bunch of keto foods, if you’ve forgotten then just scroll back up to the keto foods list. Write down a list of all the foods you like and then pick these types of foods when you get to the restaurant for example – you could have a steak salad. “Hello there, I’m eating at your restaurant tomorrow evening with my friends and I’m really looking forward to it. I’m on a diet right now to improve my health and it would be great to know what low carb options you have available?” Then make a note of the one(s) you like, and order when you’re in the restaurant. 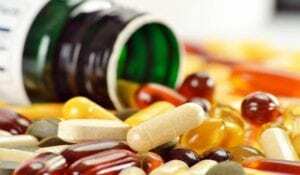 There are lots of supplements which you can take alongside a ketogenic diet, BUT before you do make-sure to run them past your Doctor, some supplements can impact medications so it’s always better to be safe. Protein powder – this is a great snack as it’s high in protein and can be taken to work in a protein shaker. You can mix with water or almond milk. There are lots of protein shakes on the market but the one i’d recommend is Gold Standard Whey by Optimum Nutrition. Multivitamin – a multivitamin will help give your body a blend of essential vitamins which will help support your body whilst on a keto diet. Turmeric – a powerful anti inflammatory. I absolute swear by this supplement, especially if you suffer with achy joints and sinus problems. Make-sure that when you buy a turmeric supplement that it also contains black pepper. Black pepper contains a bioactive compound called ‘piperine’ which has been shown to improve digestion, relieve sickness and stop headaches. Probiotics – are essential for gut health. As you’ll be eating lots of meat (hard to breakdown) and acidic foods it’s important to one consume plenty of alkaline foods like vegetables, but to also support your digestive system with a probiotic supplement. Caffeine – Yes, I said it! Caffeine is high in antioxidants and gives you a buzz. The first week or two on a keto diet can be difficult, as energy levels drop. Caffeine can be a great supplement to use to help you through the initial phase. I’d recommend having 1-2 cups of coffee per day. Try to avoid caffeine after 12pm because it can have a negative impact on sleep. Standard Keto Diet (SKD) – low carb (5%), medium protein (25%) and high fat (70%). 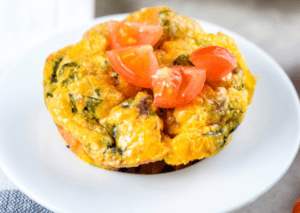 Cyclical Keto Diet (CKD) – this is where you cycle on and off the keto diet within a week, for example you follow keto 5 days per week (Monday – Friday), but then have 2 higher carb days at the weekend. Higher Protein Keto (HPK) – this is where you consume higher amounts of protein (35%) fat (60%) and carbs (5%) – this is more ideal for bodybuilders who need more protein in their diet to build muscle. Low Energy – to begin with it’s going to be tough, your body will need 1-2 weeks to get used to your new diet. If your body is used to relying on carbs for energy then it will be in for a shock when all of a sudden you stop putting them in the tank! Don’t worry though you will get used to it. Mood Swings – as you’ll be consuming very little carbs and barely any sugar you will likely feel irritable and moody. 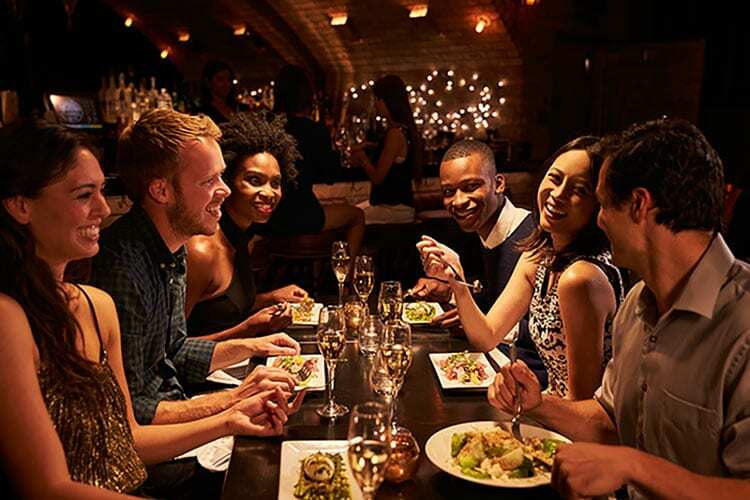 Bad Breathe – Obviously eating lots of meat and fish can give you bad breathe, not good on a first date (in fact bad breathe is never good! Lol!) – that said as long as you brush your teeth, floss, and use a good mouthwash you should be fine. You can always use chewing gum throughout the day after a meal. Cravings – there are lots of foods that you need to avoid on a keto diet and it can be difficult to resist temptation. It takes a person with strong will, especially to begin with, but the longer you do it, the easier it gets. If you are used to giving your body whatever it craves e.g. sweets, chocolate, crisps etc – and then all of a sudden say “NO”, your mind is going to kick up a fuss! Constipation – it’s easy to get blocked up by eating dense food, think of how tough it is for your body to breakdown a steak or chicken breast! That said if you chew your food properly, and have plenty of green vegetables you should be fine. You may just need to take more time eating and consume smaller portions to begin with. You could also use a digestive enzyme supplement to help you breakdown your food more efficiently. Unsustainable – can you imagine never eating carbs again? My bet is that you more than likely said NO! If I’m being honest with myself… I can’t say I’ll never eat carbs again…I LOVE CARBS! lol! So whilst the keto diet is an amazing diet for weight loss, In the long run it’s not very sustainable. 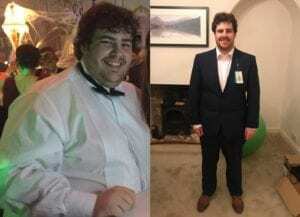 I mentioned earlier in the post that it’s best to go keto for a period of time (1-2 months) before changing course to a more sustainable way of living. I’ll do my own 28 Day Keto Challenge for quick fat loss results. Back in 2016 was when I designed The 28 Day Keto Challenge, back then I also documented my 4 week keto experience (please excuse my wacky hair lol! What was I thinking?) in this video I share my keto results, the ups, downs, some training footage of my workouts and some keto science…. According to Medical News Today people who lose 5-10% of their bodyweight can lower their risk of diabetes by 58% . Losing weight will take a huge amount of stress off your body and dramatically improve your health – lowering your risk of type 2 diabetes. What this means is the bodies ability to utilise and process carbohydrates efficiently. When somebody is prediabetic one of issues can be that their body is what’s called ‘insulin resistant’ – in simple terms this means that the body is inefficient at dealing with carbs and cant manage them. 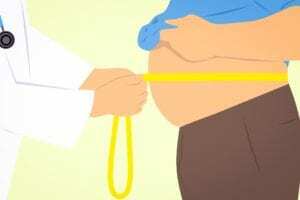 This leads to more weight gain, and also places huge stress on the body. If this goes on for too long the body can no longer manage its natural sugar levels and you become diabetic – leading to medication in order to manage the condition. The best way to improve insulin sensitivity is to switch to a low carb meal plan like a Ketogenic diet – this will allow the body to slowly recover and reset. Just make-sure that you speak to your Doctor before going on a keto plan. The other way to improve insulin sensitivity is by exercising, any exercise will help… as you’ll use carbohydrates for energy in order to move. Although all exercise is good, the best type of exercise for improving insulin sensitivity is ‘weight training’ because it allows you to target specific areas of the body and burn glycogen (stored carbs in the liver and muscles). Weight training will also help you build lean muscle, and the more muscle you have the more room you have to store carbs. In simple terms this means your body has a greater storage capacity for carbs, meaning you can eat more of them, and utilise the carbs for energy instead of fat storage. 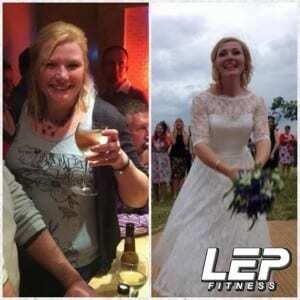 Should you exercise whilst on a keto diet? There’s no doubt that exercise will help speed up your results on a keto diet. I recommend doing resistance training at least 3-5x per week. This will not only help you burn more calories but also help you to improve your body shape. 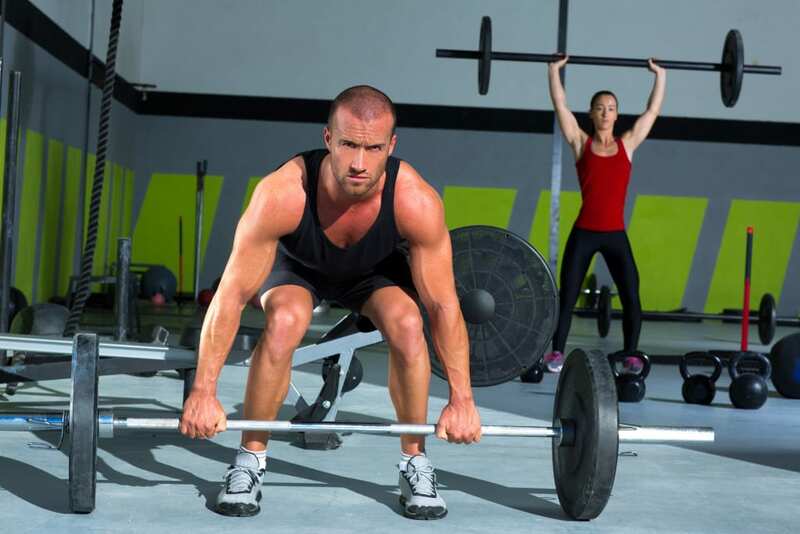 If you’re unsure of how to perform these exercises then why not hire a personal trainer ? you may only need a couple of lessons and it will be worth the investment. Failing that you could go on Youtube and watch free video demonstrations. In the 28 Day Keto Challenge e-book which I designed it also comes with an exercise program – which you can either do in the gym or in the comfort of your own home (whatever you prefer!). 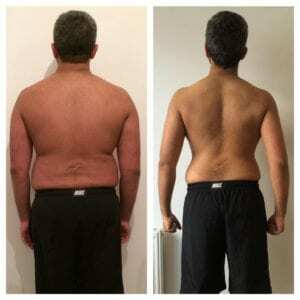 This helps clients to lose even more weight and improve muscle tone. All the exercise come with picture demonstrations and explanations to help you. Alongside weight training you could also do cardio training, even just low intensity cardio for example…. Walking an extra 20-30 minutes each day could see you lose even more weight. If you combine the added walking with the keto meal plan and resistance training you will shed some serious timber! If you can, commit to resistance training for 30-45 minutes 3-5x per week, you’ll notice a big change to your body shape in as little as 28 days. If you add into the mix 20-30 minutes of walking everyday, then you’ll be well on your way to shedding those pounds and improving general health and fitness. Before you start following a keto plan it’s important to take some physical assessments, after all if you don’t know you current starting point, how do you know that you’re improving? Of course you’ll notice that your clothes are looser, and you look healthier, but I believe it’s wise to take some tangible assessments before you start your Keto meal plan. This is so that you can see how much you’re improving and also make changes along the way if weight loss comes to a halt. #4 Take pictures – this is the most accurate way to assess progress. Take a front, side and rear shot. 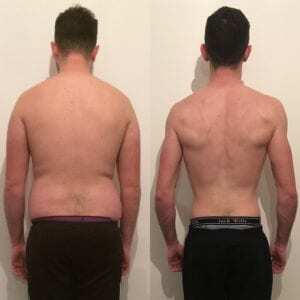 If you’d like to know about the best ways to assess progress on a fat loss phase then check out this recent post which I wrote (I go into much more detail). Who’s up for the 28 Day Keto Challenge? 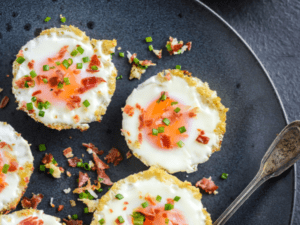 Now that you’ve had a crash course on the keto diet are you ready to give it a shot? Make no mistake it will be tough but you can do it and it’s worth the results that you get! Then why not pick up my 28 Day Keto Challenge? WHAT’S IN THE 28 DAY KETO CHALLENGE? Basically everything you need to know to shift some serious timber! whether you’re a man, or woman, old, young, fit, or unfit this plan will get to work on exterminating stubborn body fat! I’ve also used this super successful strategy on hundreds of LEP members – but don’t just take my word for it go check out the hundreds of testimonials on my site! 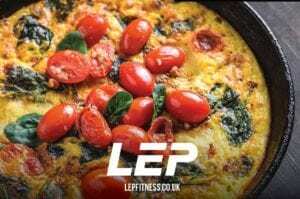 As a bonus with the Keto Plan I’m also going to send you my High Performance Recipe Book for FREE (worth £15.99!) – which you can use once your keto challenge ends, this will help you sustain your results and fit more easily into your lifestyle in the long run.